Do you have a new e-cigarette device you want to customize? I have an old one that needed a makeover. 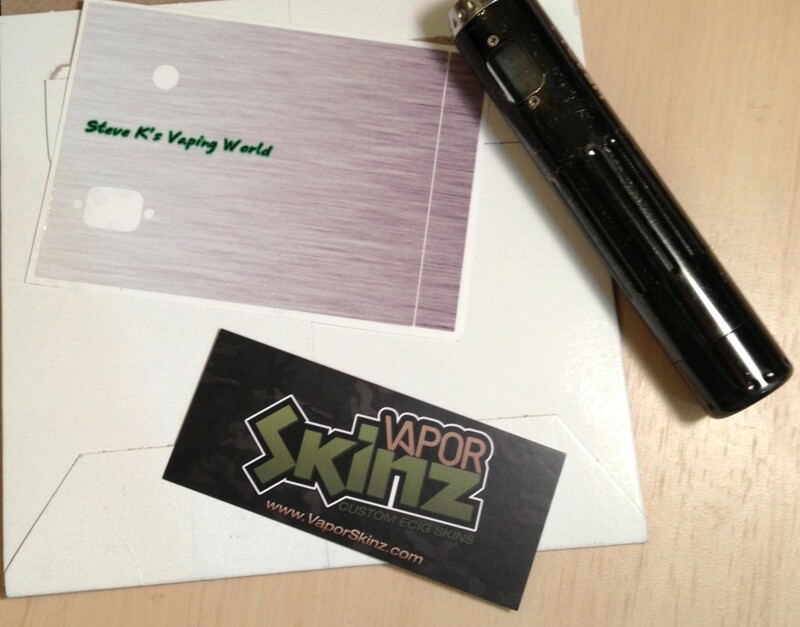 Vapor Skinz makes wraps for a huge variety of advanced e-cigarettes in several different styles. I picked one up for a faithful old APV to give it a fresh new look. Naturally I can’t buy something new without writing about it, so here’s my Vapor Skinz Review. I picked up a wrap from Vapor Skinz to dress up my old ProVari. If you’ve followed this site for any amount of time, you’ve watched my faithful ProVari go from shiny and new in the original review to battle worn by the time I published the comparison with Apollo’s V-Tube. It works great, but its appearance leaves something to be desired. Vapor Skinz offers both pre-designed skins as well as your own custom designs for a few dollars more. The company is pretty good about making skins for tons of different devices from eGos to new stuff like the Joye eVic. There is a pretty good choice of patterns, though it seems that it tends to favor “guy stuff” like camouflage (also in pink). There’s also some really cool Doctor Who skins as well. 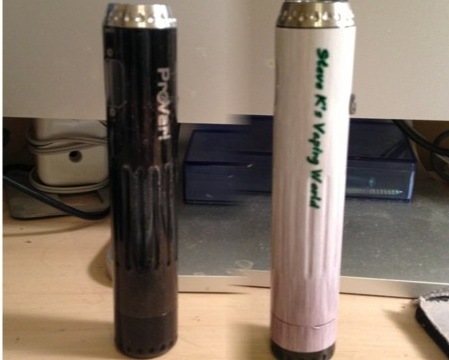 I contacted the company and asked about doing a custom wrap for my ProVari with my site’s logo on it. I also didn’t want the logo to cover the entire side of the device. Instead I wanted to basically do some sort of pattern with my site’s logo in place of the stock ProVari emblem. I had some back and forth conversation about what I wanted and sent my logo file. I then promptly didn’t reply to the e-mail for about a month. When I finally did, I sent my logo file superimposed over a generic stainless steel background. I got back a mockup of my design. And, well, it wasn’t good. You might have noticed I don’t have the best eye for graphic design. Finally I just explained what I wanted and asked if they could just take my logo and stick it on some sort of metallic background. I got back a much more acceptable file so I pulled the trigger, impressed with how patient they’ve been with me through the process. A few days later I got a rigid shipping envelope with my new wrap. Essentially, it’s a big sticker made from the same stuff they use for car wraps. It featured my design with die-cut holes for the display and fire button along with a narrow strip intended to wrap the battery extension cap. Besides being bad at graphic design, I’m also bad at putting stickers on stuff. Whenever I try to put screen protectors on my phone, there’s always bubbles I can’t get out. Therefore, I decided instructions would be helpful. There was no instruction sheet included in the package. A quick visit to the Vapor Skinz website also did not yield any help. A quick Google search found a video made by Vapor Skinz on exactly how to apply the wrap to a ProVari. Note to the Vapor Skinz folks if you’re reading this: put a link to the video on your site. Installation was a matter of lining up the display cutouts with the display and screws, then working the skin on to the rest of the device. I had a couple of bad starts, but you can peel it back and start over as you go if you’re careful not to stretch the sticker. I finally got the thing on, though there are still a couple of bad spots. Once I got it on, I noticed that for some reason the background was much more white than faux stainless steel. It still looks good, but I think it might be wise to try to avoid simulating metal with a vinyl sticker. The only real complaint I have is that the strip intended to cover the extended end cap was a little narrow, exposing a bit too much of the black metal at the bottom. For those of you who haven’t carried around your favorite device in your pocket with your keys for nearly two years, it’s worth mentioning these skins come of clean. It would be a good way to protect a shiny new device as well. I’m tempted to get wraps for more of my stuff, but I think I’ll stick with the pre-done designs. Maybe a nice wood grain would lend an air of sophistication to my MVP or something. You can visit VaporSkinz.com to see their selection and prices. PREVIOUS POST Previous post: New Vapor4Life Coupon Code 20% off!